Not everyone is as happy with the picture as you are, Mr. Twigg. 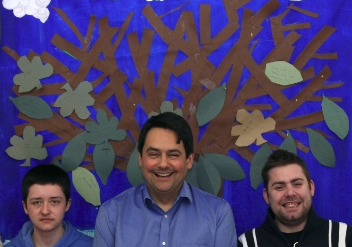 COMMENT – I’ve been thinking about Stephen Twigg quite a bit recently. He’s principally famous for that cheeky grin when he realised, back in May 1997, that he’d created what was to be the iconic moment of the general election (we’ll set aside John Prescott and Neil Kinnock dancing to D:Ream’s ‘Things can only get better’, because it’s the stuff of some people’s nightmares) by defeating the smug Thatcherite Michael Portillo. He ought now to be famous for being the opposition spokesman on education; however, were you to conduct a poll of serving teachers and ask them to name the shadow education secretary and the shadow chancellor, they’d almost certainly name Ed Balls for both jobs. I think that this is because Twiggy appears to be somewhat wet and inept; however, greater cynics than me – and I’m sure there must be one or two out there somewhere – might suggest that his apparent lack of anything approaching opposition to Michael ‘slash and burn, fire is so cleansing’ Gove owes much to the fact that Twiggy largely agrees with much that has been done to education since the change of government in 2010. What teachers want to know – and they want to hear Twigg’s voice clearly on this – is what would change if Labour were to win the next election. As I don’t believe there has ever been a time when so many teachers were so angry with the current government, Twigg is doing his own party a dis-service by failing dismally to identify tangible differences (you’ll forgive me for not calling it ‘clear blue water’) between his values and policies and those of Gove. I should declare my interest in comparing the actions and policies of Conservative and Labour governments at this point. I spent the whole of my teaching career, from my probationary year in 1981 up until the first year of my first headship in 1996, under Conservative governments. That was sixteen years in total; sixteen years in which we all had to teach whilst penny-pinching in the worst possible ways, as school budgets quickly became – and then stayed – woefully inadequate. I was once handed a premises report done by the local authority on our long-neglected school buildings, identifying which areas needed repairs or refurbishment and giving them a ranking in terms of the urgency for health and safety reasons. So long and so great had been the neglect caused by government underfunding since 1979 that the estimate of cost for the repairs required ‘immediately’ (for health and safety reasons of the most pressing kind, I should add) was around a million pounds. The amount in my budget for that year was £56000. Robbing Peter to pay Paul wasn’t even an option for state school heads for many years, because Peter was already off down the shopping mall selling the Big Issue with his pet Lurcher, Keith. Well, yes and no. This is, surely, a fundamental Labour principle we’re talking about here – that businesses should not be allowed to run schools for profit. Those of us with experience of running actual schools know very well that the only ways to make a profit out of it (especially under a Conservative government) will be to the detriment of the children the school serves. Those in favour of the idea usually talk of the ‘greater efficiency’ which they are certain will automatically occur if the private sector is allowed to run schools and my response to them always includes the following words: Northern Rock, Royal Bank of Scotland, HMV, G4S. I could add quite a few more, but you get my drift, I’m sure. Moreover, anyone who was ever a headteacher under the previous Conservative administration knows a great deal more about fiduciary ‘efficiency’ than any generously salaried and bonused CEO ever will. What I’d like is to hear Twigg declare passionately that state education puts children first and will not – in any shape, manner or form – make money for the benefit of anyone but the children under a Labour government. Instead, however, we hear him being mostly a bit vague about what he might do were he to inherit the big chair at Sanctuary Buildings (I once went there and it was like Shangri La, all tinkling fountains and expensive furniture), a bit of mumbling about how the last Labour government wasted too much money on the process of the ‘Building Schools for the Future’ and how they were wrong not to implement the Tomlinson report on 14-19 education. Well, you don’t say! The thing is, what Twigg, Milliband (minor) et al don’t appear to realise is that it’s all very well holding up their hands and admitting that it had all gone more than pear-shaped by the time Brown was forced to call the general election, but what people want to hear is something approaching vision, values and policies. There used to be a time when the Labour party was filled with people who were genuinely and passionately committed to the things in which they believed, things which were about the good of the many, not the few; these days, the most senior shadow cabinet positions appear to be occupied by people whose lack of commitment to anything other than their own self-aggrandisement is their most prominent feature.